Excelworkbook to create text or AutoCAD dwg from template. ExcelFileGenSheet, is an Excel tool which can create textbased files or AutoCAD dwg's from a template. If you use Excel 2010 or newer, please use the new ExcelProGen Add-In. 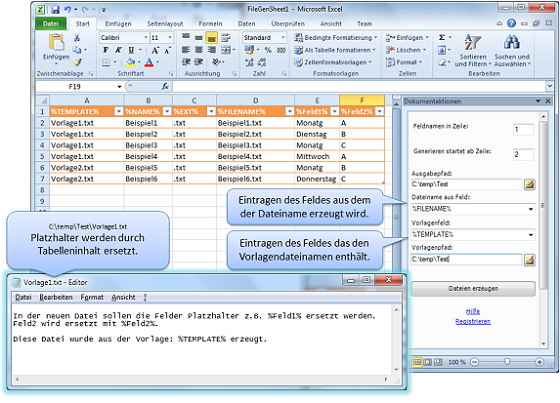 This Excel 2007/2010 template makes it possible to generate textbased files from templates automatically. It will create one file by Excel-row. If you are using AutoCAD (min. version 2002), you can also create AutoCAD drawings from DWG templates, or you can update AutoCAD files with new values. The Excel sheet is using COM automation for its work, so you can't use AutoCAD LT. ExcelFileGenSheet is reading blockattributes to replace its values. It also checks TEXT and MTEXT for placeholders defined on the sheet header. After Installation of ExcelFileGenSheet you will find a new template if you go to Excel => File => New => My Templates with name FileGenSheet. If you open it, you will find a user interface beside the sheet with tools to create your documents. To create files you have to define one column with filenames. ( in the sample i use %FILENAME% ) The sheet contains one column which will tell the engine which template to use. ( -in this example I use: %TEMPLATE% ) All other fields are one of the placeholders in the template file. Respectively you can use the offline install package as well. Since Office 2013 you may not find the template. You can do the following in order to find your personal templates like ExcelFileGenSheet. In Windows 10, copy and paste the following in the Cortana Ask me anything box, and then press Enter: %appdata%\Microsoft\Templates\ (In earlier versions of Windows, click Start > Run, and paste that in the Open box). Copy the address that's displayed in the File Explorer address bar. In your Office program, click File > Options > Save, and then paste the address into the Default personal templates location box. Make sure you do this for each Office program. After you’ve updated your template location, any new templates will be saved to this default location. Please register if you use it longer than 30 days.